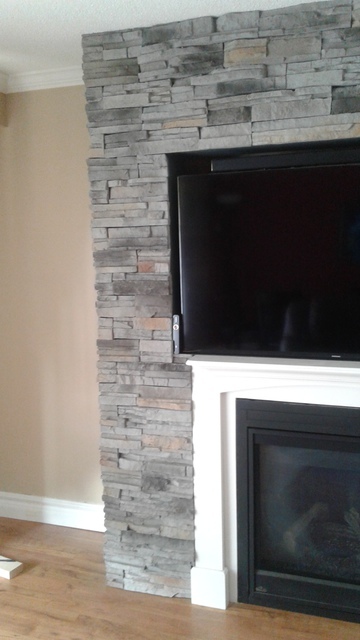 We wanted our new gas fireplace to be the focal point of our living room and had initially looked at the stone facing available in local night box stores, but I couldn't find exactly what I wanted, so I made the trip to the Stone Selex dealer (Acadian) in Markham. Absolutely worth the drive! Sherri was extremely knowledgeable and helpful. Their display wall clearly showed the flat stone as well as corner treatments (which is an important consideration) and Sherrie's input helped me decide on the perfect stone for our project. All interaction with office staff for scheduling and payments was easy and efficient. Andrei, from Stone Selex, performed the installation and he was promt and professional and the finished product is beautiful. I would highly recommend Stone Selex and wouldn't hesitate to use them again. Good day We are very pleased that you are enjoying your stone installation around your fireplace. Thank you for sharing your experience with us. It was our pleasure to be working with you on your fireplace project. it would be great to see some pictures. All the best, Stone Selex Design team.